In a world that struggles to understand loving one another or showing love and respect to others, we as Christians should be easy to find because of our love for other people. Unfortunately, too often, we blend into the crowd. So for this week, let's meditate on how Christ's love can be shown through our lives and how we treat others. 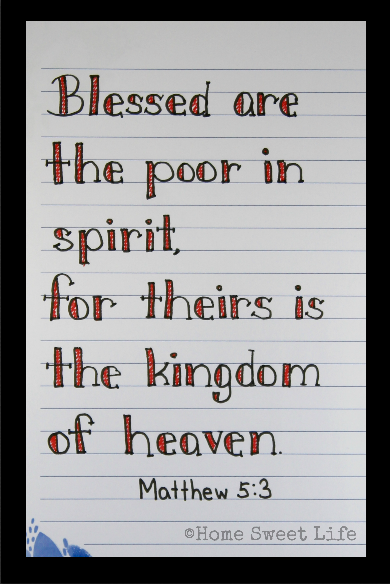 Along the way, let's look at the beatitudes from Jesus' teaching in Matthew 5. These are not just random words, but guidance to live by. They remind us that this is not our home, but that we should be looking ahead with joy to our eternal home in heaven. Jesus taught His disciples that perfect love casts out fear. John told us about this lesson he learned from Jesus in 1 John 4:18. Though we are not yet made perfect, may our love for Christ and others be the bridge that casts out fear, so that others would be drawn to Christ and the peace only He can offer. Each day for the next 8 days, I challenge you to memorize a verse from Matthew with me and ask God to show you how to live it our for His glory! So for today, let's work on Matthew 5:3 together.